Yesterday Stephen Totilo posited that Nintendo's problems stem from a lack of killer games. In today's Speak Up on Kotaku, commenter GeshGav agrees, though his idea of killer games is a little bit different. If I'm known for anything (gaming-wise) in my circle of friends, it's that I'm a rabid fan of Donkey Konga. The GameCube series revolutionized my evenings back in 2004-5, ensuring calloused palms and strong forearms through its unique 'bongo' controller. For those who haven't played; it's a rhythm game not unlike Guitar Hero - only played on a horizontal scrolling plane. It supports up to 4 players, and affords the opportunity to play through a varied roster of rock/pop tracks as well as tunes from Nintendo's stories past. Donkey Konga 2 continued the trend, but fell slightly short of the original's grandeur. With Donkey Kong: Jungle Beat, we saw that bongos were the DEFINITIVE method for controlling a platformer. Players would beat the left or right bongo drum to move in each direction, pounding both to jump and clapping above the bongos to attack/collect items. It was a beautiful testament to lateral thinking, marking the shift in my mindset to 'try anything once, you might like it'. 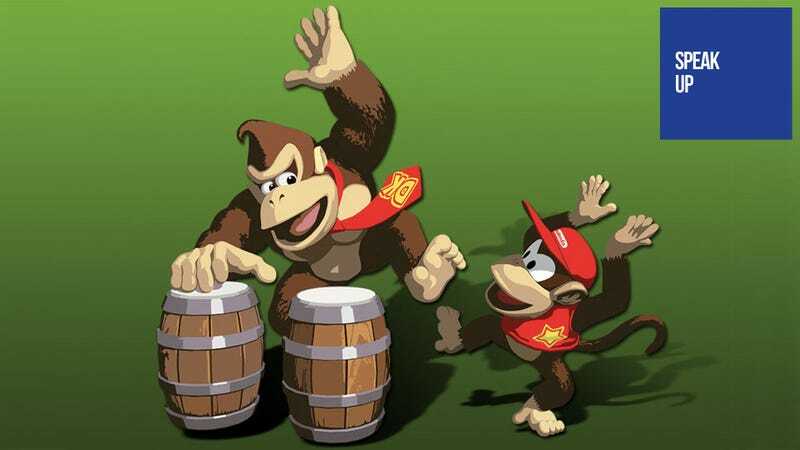 I never understood why Nintendo didn't push the bongos to their fullest. With the Guitar Hero and Rock Band titles selling in astonishing amounts - Nintendo failed to capitalize on this trend with the Wii. Despite backwards compatibility with GameCube hardware, no Donkey Konga game was released. It's a much simpler, less intimidating affair; much more suited to the casual audience they were looking to hook at the time. They even went so far as to release a title developed for the GameCube called Donkey Kong Barrel Blast, which was a racing game originally designed to utilize the bongos - but removed the actual bongo support. AAAAAAAAAAARGH. What I'm basically saying is - Nintendo, y'done fucked up. Now bring back those damnable bongos. Anyone else have the love for the Bongos? I've said Bongos a lot in this post.